I spent 99 cents to get my head plastered into a Dilbert Comic Strip. Was it worth it? Heck, yeah, particularly since writing was the theme of this comic strip. Although, that sounds nothing like me. Does it? See the animated video of the comic. Bud Hunt shared this on Twitter and I am trying to think about the possibilities here. In a nutshell: a band out of Washington DC is putting out new music as an album, but the album is not vinyl, disc or even an iTunes music download. It’s a location-aware App that works only in the vicinity of the Mall on DC. As you wander the Mall, the music changes based on where the piece was composed. It’s pretty fascinating how indie artists are always pushing boundaries and I love that music is one of those things that can become the cornerstone of re-imagining art. This particular idea not completely revolutionary — museums have been handing out mobile devices for some time, right? You wander with the device and learn about the art. But here, the listener makes the path, and the music is shaped by the path you take. What you hear is what the composer and musician saw when they were in the act of creating the music. I love that connection. I know nothing about the band, and given that I live nowhere near the Mall, I may never listen to this album. But it fascinated me just the same. The National Mall by BLUEBRAIN. The First Location-Aware Album from BLUEBRAIN on Vimeo. My class is working on Poems for Two Voices this week, and our plan is to use our school’s iPod iTouches for podcasting. I’ve gone around and around on the best way to go about this, and decided that I would set up a classroom account on Cinch and have us podcast and post on there. I’ve already had to think of some workarounds, mostly because our iTouches are not the latest generation and we need to use a headphone/microphone unit for recording. In my head, I had this great vision of two students, each with headphones, connected by a jack splitter to the iTouch, recording. Well, reality hit. The touches have an odd jack input, and my splitter that I usually use for connecting headphones won’t work. So, we are going to have sit the headphone w/microphone in front of each pair, and record like that. We’ll live with the background noise, I guess. On Tuesday, I am going to let them podcast a few of their own poems, individually, so they can get the experience of working the headphones. To make sure the idea would work (always a good thing), I wrote a poem myself about writing and math, and asked my math teaching colleague to record it with me. He took the writing part and I took the math part, just to flip our normal roles. It sounds OK, actually. I was stuck the other day (again) with a file on my home computer — dutifully in my “school work folder” — and for the last time, I realized that I needed to figure out a better system for sharing work with myself. As it happened, that afternoon, a technology magazine that I subscribe to did a whole spread comparing Dropbox (which I know many people use) and SugarSync (which I had never heard of before). What the heck? I installed it, and wow, it is nice now to be connected to my files here at home and there at school. I know this is no revolutionary idea for many of you and it reminds me how so often things like Dropbox are on my radar for months and months, but I just need the opportunity, need and time to put it to use. What kind of syncing program do you use? I won’t take credit for this, other than I helped figure out how to bring all of the student projects together with LiveBinders. 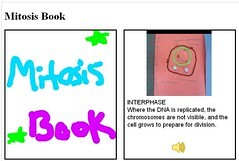 But my science teacher colleague has been one of a group of teachers piloting the use of our new iPod Touches, and she learned how to use an app called “Storykit” so that our sixth graders could collaborate on a story about cell mitosis. She has traditionally done these on poster papers, but moved to the mobile devices this year. I like that you can add images and audio with Storykit, and that it publishes the story online with a link. I don’t like that you can’t embed the story from the Storykit site and the layout is sort of boring (but it is much more interesting on the Touch itself — more fluid and interesting). The kids didn’t care, though. And the use of the Livebinder brings them all under one “roof” to share with families and with the other classes. I sat with some teachers in an English Language Learners graduate class yesterday afternoon to introduce the concept of digital storytelling and emphasizing how using technology to tell a story can honor and celebrate student voices. The instructor is part of our Western Massachusetts Writing Project, and she sat in on a claymation animation camp I ran a few years ago. PS — I have added this resource to my Digital Storytelling website. I wanted to alert you to an interesting Teachers Teaching Teachers program that is slated for tonight on the topic of gaming. It sounds like hosts Paul and Susan have a lot of interesting folks coming onto the air to talk about the rationale and potential of bringing elements of gaming into the learning environment. How did you all begin including gaming curriculum in your classrooms? What are some of your biggest successes? Challenges? How much game playing goes on in your classroom? Do students only play in social action games? What does that conversation look like? What norms are set prior to this? I’m thinking about using the games students play on a regular basis as media for students to deconstruct and analyze in terms of influencing identity. Should I be playing all these games to get a better idea? Or will observing the students play suffice? What does a teacher do if he or she is not good at playing those video games? Designing games really requires deep content knowledge. How much experience with game design did you have prior to letting the students explore that avenue? Could you tell us about Scratch? What are the benefits of this program as compared to Game Star Mechanic? What kind of evaluation do you use around gaming? Is it all informal discourse based assessment, or do you do something more formal? Has your game playing been limited to computer games or have you also used standalone consuls? How much time did you have to dedicate to help students understand how to utilize the game design tool before they began designing? Do you feel that this time has been detrimental to fulfilling your ability to satisfy state standards? Game-based learning has gained considerable traction since 2003, when James Gee began to describe the impact of game play on cognitive development. Since then, research and interest in the potential of gaming on learning has exploded, as has the diversity of games themselves, with the emergence of serious games as a genre, the proliferation of gaming platforms, and the evolution of games on mobile devices. Developers and researchers are working in every area of game-based learning, including games that are goal-oriented; social game environments; non-digital games that are easy to construct and play; games developed expressly for education; and commercial games that lend themselves to refining team and group skills. Role-playing, collaborative problem solving, and other forms of simulated experiences are recognized for having broad applicability across a wide range of disciplines. Teachers Teaching Teachers has been focusing on gaming on and off this past year (see the archive of programs around gaming) and given the roster tonight, it is worth listening in, or waiting to hear the podcast (which is what I will need to do). The show takes place live tonight, Wednesday, May 25 at http://EdTechTalk.com/live at 9:00pm Eastern / 6:00pm Pacific / World Times. We’re wrapping up our online discussion of the book Because Digital Writing Matters, collecting some final thoughts and mulling over where digital composition is going in the future. The discussions at our closed iAnthology site have been deep, probing and wonderfully illuminating as we teachers in the National Writing Project think about where we are and where we may be headed. I used Cinch to record my own ideas as a podcast. Now, we have our own YouTube Channel for the Western Massachusetts Writing Project. Our hope is to slowly grow this video collection of work being done at our site as we seek to raise our profile, including using our web presence. The Youtube Channel now joins the WMWP Twitter feed and the WMWP Facebook page as more places we call home in the world.